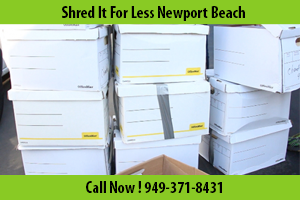 If you are looking for secure document shredding services in Newport Beach, then your search has come to an end! Shred Connect provides secure document shredding services along with the best customer service. Our customers are our main priority and we aim to please by providing the paper shredding services they require at an affordable price point. All materials are recycled to offer secure and environmentally friendly disposition of shredded documents. No matter who you are, from a small business or a residential customer, we are here to serve you. Our document shredder services have been specifically tailored to meet the individual needs of our varying customers. We know how important it is for a business to meet their confidentiality requirements and that is why we offer on site shredding. Protecting sensitive data from entering the wrong hands is a top priority for any business, so it is vital that you choose the right shredding company that knows exactly how it’s done. We have designed all of our secure document shredding services with security in mind. For added precaution, our mobile document shredding trucks are equipped with cameras to offer you the chance to witness the full destruction process. This ensures that all companies have the opportunity to see our industrial paper shredder destroy their confidential documents and keep their peace of mind. We can provide you with an ongoing service, as well as one-time paper shredding services. Our secure document shredding service comes complete with a certificate of destruction so you can keep a record of any document destruction. It’s not only businesses that can benefit from our shredding service – we serve local individual customers as well. Not everyone owns a document shredder, or has the time to shred paper. 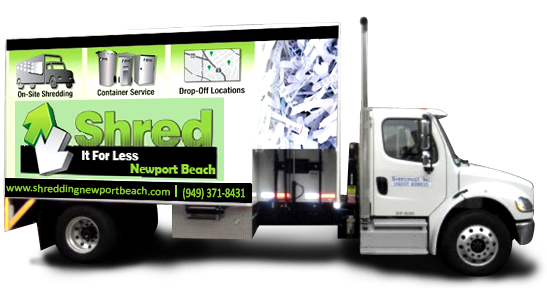 We offer a mobile shredding service that can come right to your door for your convenience. To make things even easier, you don’t even need to worry about preparing your documents beforehand. Everything from staples, Pendaflex, paper clips and binder clips can be shredded. The service is quick – shredding takes about 2-3 minutes for 6 or 7 boxes. If you have a habit of storing old documents that you no longer need, but don’t want anybody else to see, then going to professional shredding companies is the ideal solution. Create some extra space in your home and get rid of all of those unnecessary documents, in a safe and trustworthy environment. If you would rather come to us, we have come up with the ideal solution. Although we do not have storefront locations, we have come together with mail and self-storage facilities that can meet your paper shredding requirements. All of your documents are shredded on-site and meet document security standards, so no need to worry about your sensitive information ever leaving the premises. This service also includes a Certificate of Destruction if necessary, which you can receive by mail or email. Secure: All of our employees are pre-screened and certified to ensure maximum security. Compliant: All of the services we provide are performed in accordance with document security standards. Customer Satisfaction: We aim to provide you with first class customer service, with weekend services available. Customer support is available 5 days a week, from 8am to 5pm. If you want to learn more about our services, feel free to contact us today. You can fill out our contact form online for any general inquiries. You can also contact us via email or phone and get a quote.